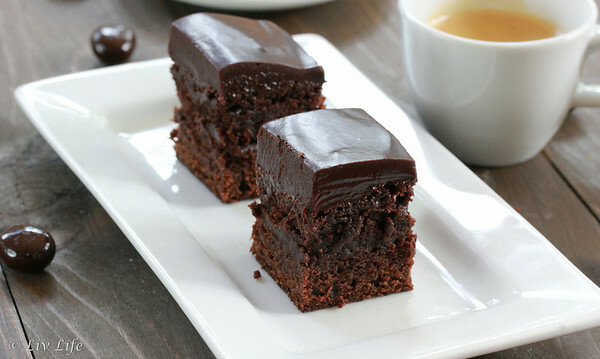 The description of these brownies on Fine Cooking mentions the richness, and therefore suggests cutting into small pieces. I completely agree on the small pieces as it makes me feel less guilty as I reach for seconds! Don't have Kahlua? You can make your own with our Homemade Kahlua Recipe. Position a rack in the middle of the oven and heat to 325° F. Line a 9x13 baking pan with foil, allowing the edges to hang over the edge of the pan for easy removal. Lightly grease the bottom and sides of the foil. In a medium bowl, whisk the flour, baking powder, and salt to blend. In a large pan over medium heat, melt the butter, stirring occasionally. Remove the pan from the heat and whisk in the cocoa powder until smooth. Whisk in the brown sugar until blended. One at a time, add 3 of the eggs, whisking until just blended. With the last egg, whisk in the coffee liquer and 2 tsp ground espresso beans. Add the flour mixture to the chocolate mixture, stirring until just blended. Scrape the batter into the prepared pan and spread it evenly. Place into the oven and bake until a toothpick inserted into the center comes out with a few small, moist clumps sticking to it, about 30 minutes. (Don't overbake, or the squares won't be fudgy). Transfer the pan to a rack to let cool completely. Gently pulling on the foil "handles" remove the brownies from the pan. 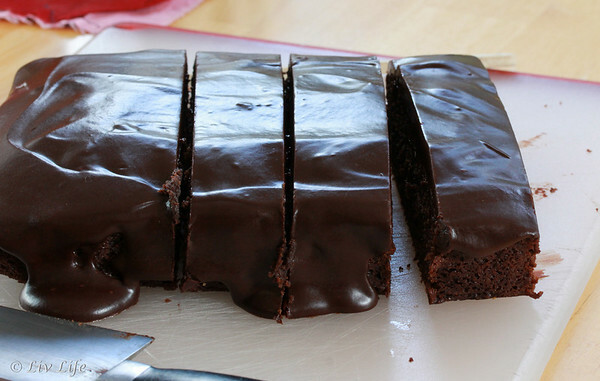 Peel the foil away from the brownies and place on a cutting board that is larger than the brownies. Bring cream to a simmer in heavy small saucepan. Remove from heat. Add chocolate and whisk until smooth. Whisk in 1/4 tsp vanilla and Kahlua. Refrigerate until thick enough to spread, stirring occasionally, about 45 minutes. Spread topping over brownies. Refrigerate until topping is cold, about 1 hour. Remove from oven and using a hot knife, carefully cut the brownies into squares. Let brownies stand at room temperature 30 minutes before serving. Enjoy!! "What do you like about this food blog and why?" - well, the recipes of course, but what I love about this blog is that Kim is a genuinely caring person. You can feel the love she has for her family and friends in each post. These brownies look amazing and you have really brought back a memory for me because my grandmother used to make homemade Kahlua. Wishing you and your family every happiness this holiday season. My dear Felice... you made my day!!! Thank you! And much love to you and your family too! These look delicious Kim, will be trying them for sure! What a delicious treat for the holidays Kim! I haven't had Kahlua in years, but I fondly remember it! I love that you include so many great photos with your recipes. 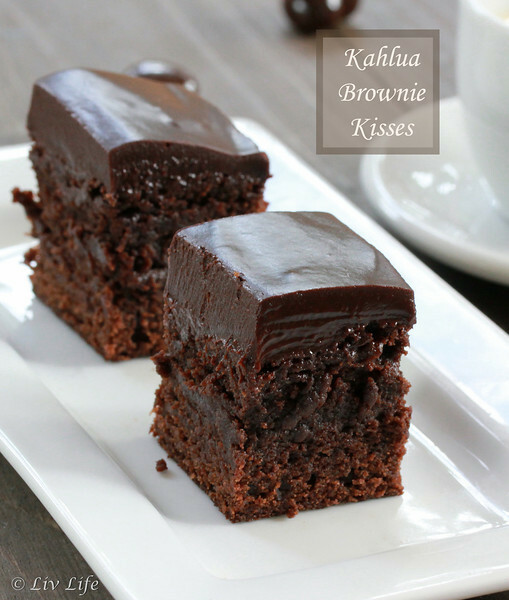 These look delicious, the kahlua sounds so good in the brownie. Will try. Love the recipes especially the Kahlua Brownie Kisses. I love hearing about your trips and also the great food recipes. Kahlua is one of my favorite flavors. Adding it to chocolate sounds so good! These look delicious! These sound absolutely delicious! I love seeing the variety of recipes you share here! I'm a sucker for dessert, so I love all our recipes for sweet treats! Also, you provide such great photo instructions with each recipe, and it makes it super easy to cooking/baking dilettantes like me. Great giveaway! LOOVE this giveaway and those brownies!! To die for! Hi Kim: SO much fun to be doing this giveaway with you - and those brownies look AMAZING! Hope you have a wonderful holiday season! Yummm!!! I'll be making these for Christmas! 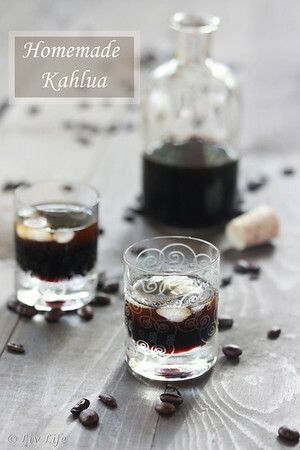 What I love about this blog is this Kahlua recipe today! I love all the yummy recipes! I like all the recipes, they give me lots of good idea's. You have no idea how incredible this looks! Though that's clearly not true (I'm sure you have every idea how incredible these brownies look--and taste, for that matter). I've been on a Kahlua kick recently, so this will be perfect. As a Southern Cali blogger myself, your group sounds super swell :) How did you gals come up with the idea? Communities are fantastic. Love it!